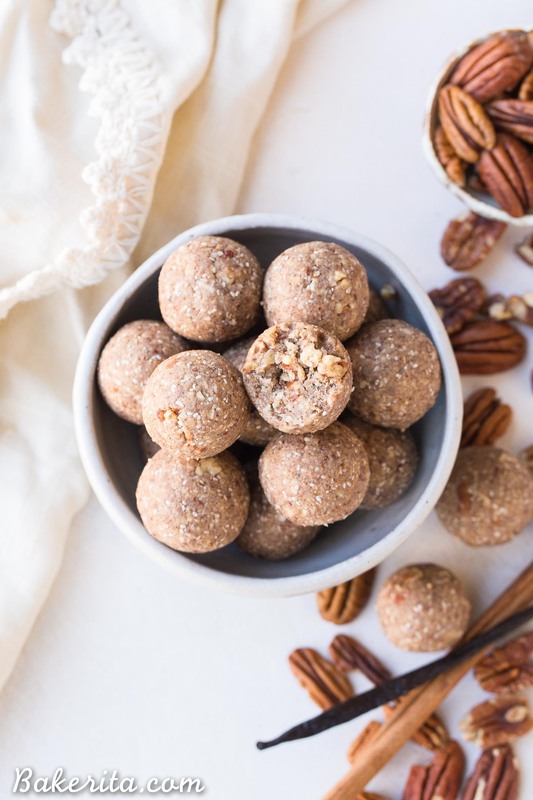 .These Pecan Pie Fat Bombs are a super filling nutritional powerhouse, with loads of healthy fats and protein, and no sugar needed! 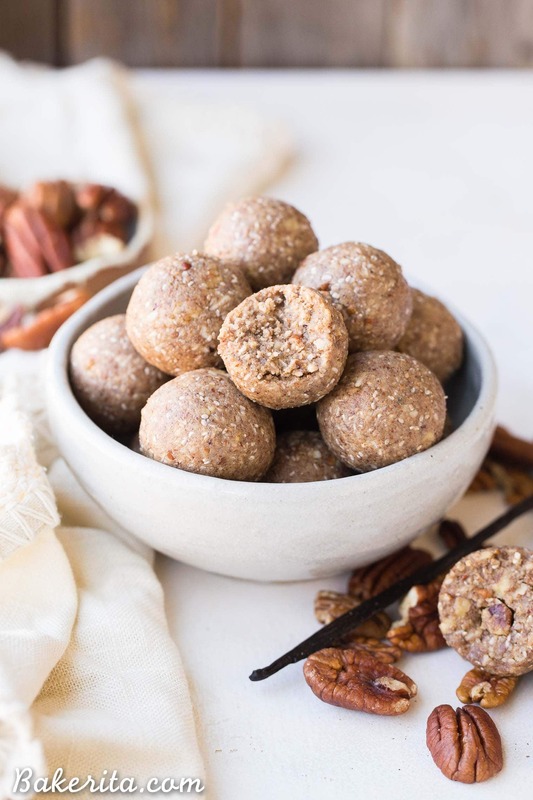 These fat bombs full of vanilla bean and buttery pecans, and they’re gluten-free, paleo, vegan, and keto. So if you don’t follow me on Instagram…you may not have seen the news: I have a new family member!!! 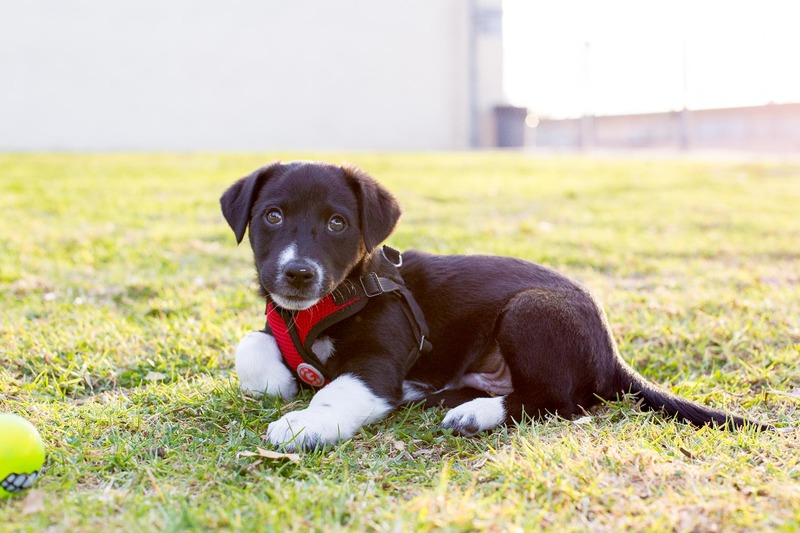 His name is Hank, and he is a tiny Border Collie mix puppy. He weights in just under 7 pounds of total and utter CUTENESS. I went into Helen Woodward Animal Shelter, the same shelter I got Bear from almost 13 years ago, on Saturday…”just to look.” After having little Hank in my arms for a few minutes, I couldn’t give the little guy up. He’s supposed to grow up to be between 25 to 40 pounds! I don’t know exactly what he’s mixed with because the shelter never met his parents, so it could be more or less. So far, he’s been difficult, but also SO sweet and such a good little boy. He’s incredibly playful and so smart and he’s already starting to get the basics of potty training. I can already tell he’s going to be a great little friend for the next many, many years! If you wanna see pictures of him and follow along for lots more of Hank, you can follow his Instagram @the.great.hank! Let’s talk Pecan Pie Fat Bombs! Now, let’s talk about why you’re really here: the recipe for these delightful Pecan Pie Fat Bombs! With all the New Year Resolutions and everyone eating at least a little bit healthier for January, I thought a filling, low-sugar snack would be the perfect recipe to kick off 2018. If the term “fat bomb” deters you – don’t let it! The name refers to the fact that this ball of pecan pie goodness is loaded with healthy fats. This makes for a low-carb, higher-protein treat that perfect for the Keto diet – among many others. 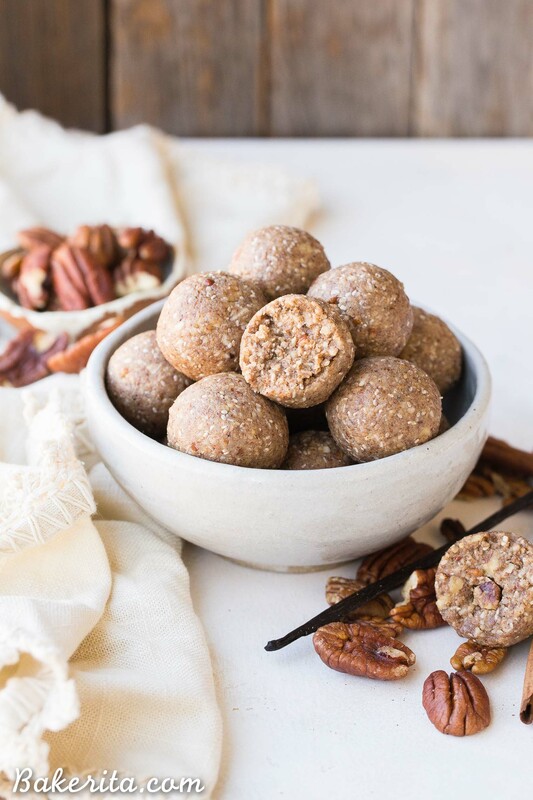 These Pecan Pie Fat Bombs fit pretty much all diets (except nut-free): they’re gluten-free, grain-free, paleo, vegan, Whole30-approved, AND keto (if you leave out the date). They are loaded with healthy fats, so just one of these fat bombs will help keep you full for a while. I adapted this recipe for my Nutty Coconut Fat Bombs, which have been a staple in my house since I first made them. I’m constantly grabbing one of the fat bombs: either it’s a pecan pie fat bomb, my original fat bomb, or another flavor I’m experimenting with. Whenever I’m hungry and need food ASAP but don’t have time to make something, a fat bomb is perfect. I hope you’ll give these Pecan Pie Fat Bombs a try. Let them fuel you towards your New Year goals and resolutions!! I’d love to hear any other flavor ideas you’ve got in mind as well…I’m wanting to make ALL the fat bombs. Enjoy! 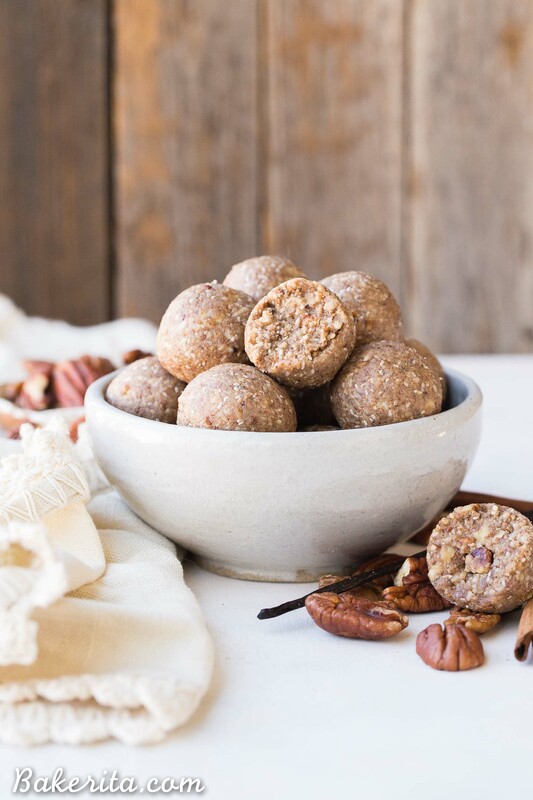 These Pecan Pie Fat Bombs are a super filling nutritional powerhouse, with loads of healthy fats and protein, and no sugar needed! 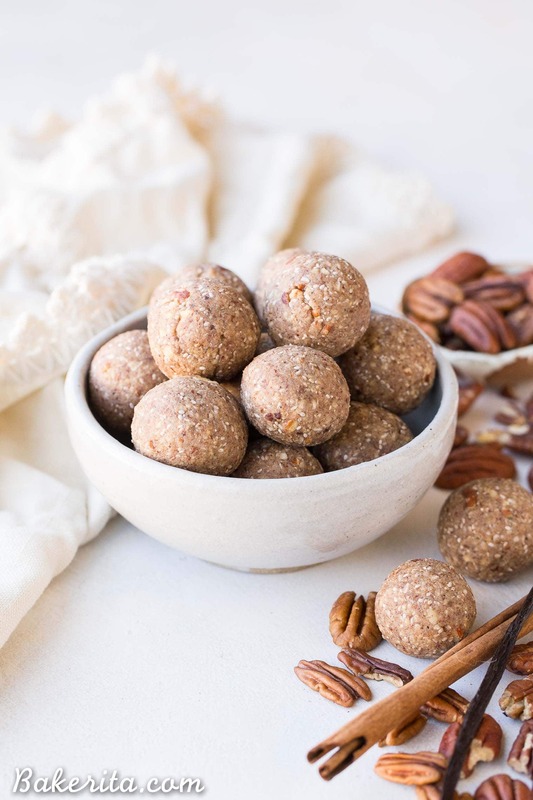 These fat bombs full of vanilla bean and pecan flavor, and they're gluten-free, paleo, vegan, keto, and Whole30-approved. In the bowl of a food processor, combine all of the ingredients. Pulse for about 1-2 minutes, until the mixture starts to break down. It will first become powdery and will stick together, but still be crumbly. Use a small cookie scoop (I use this one) or a tablespoon scoop to divide the mixture into equal pieces. Use your hands to roll into balls and place on a plate or baking sheet and place in the fridge to firm up for about 30 minutes. Nutritional info is calculated WITHOUT the date. Cacao nibs not listed in ingredients. How much? Hi Sharon, my bad – I ended up not adding cacao nibs to the recipe and forgot to remove it from the directions. It’s fixed now! Have you tried it using vanilla extract instead of the powder? I would like to make this tomorrow but I only have extract. Do you think it will work or add to much moisture to the dough? Hi Doris, thanks so much!! Yes, I actually meant to do that and totally forgot – been busy with puppy brain, haha! I’ll add the info now. Now its in the fridge to harden up a bit to form the balls later. Possible to be from the blender ? I had everything come together really good, no big chunks of any of the ingredients though. What a great idea for a “save”! Do these (the main recipe) have stay in the frig? We’re traveling n to Europe for 3-4 weeks in June and these would make great traveling snacks! Hi Debbie, you know, I’ve always kept them in the fridge but I don’t see why they wouldn’t be fine at room temperature for at least a week or so…maybe just refrigerate when you can? If your hotel or anything has a fridge? They should be just fine though! Sorry! Just saw it at the top. My bad. Hi Tara, glad you saw it in the top there, hope you enjoy them!